The LEADER OF XXI CENTURY AWARD (also known as LEADER OF XXI CENTURY INTERNATIONAL AWARD) is one of the prizes awarded by European Council on International Relation since 1998. In 1998 at the threshold of a new millennium a collective of international academics , political personalities from European Union member countries decided that the new century requires a special prize dedicated to influence and support political key figures ( presidents and prime ministers etc.) to direct their countries and peoples on the road to direct democracy, social economy and a fair society. On this occasion was decided the title and the methodology of the LEADER OF XXI CENTURY AWARD. According to 2001 decision of Board of European Council on International Relation the Prize should be awarded under considerations as : This title will be seldom awarded and only after a very carefully examination, as the receivers will be leaders of the century, there work all thou concentrated in a year will have to reflect decades of actions and achievements with positive influence over peoples and countries. Extremely important it was decided in order to avoid controversy (such the highly controversial Nobel Prize for Peace being awarded to Henry Kissinger or to a Chinese dissident in 2010 etc.) that the title will not be awarded on yearly bases but only when suitable candidature will be presented . Among the reasons for awarding this title the Board should have under consideration : the promotion of a free and open society in the recipient country and his/here support for an open society in the world, the creation of an economic social balanced climate destined to offer to everybody a chance in social participation and inclusion , the attention played to human rights such as dignity of life, right to education, to home , to medical assistance , political participation . Also the awarding committee should weight the receiver commitment to direct democracy and social and economic development issues and also the international status of the receiver as a supporter of peace, multilateralism and equilibrium in international relations arena and a lofty personality. International personality’s opinions on LEADER OF XXI CENTURY. Marc Perrin de Brichambaut, Secretary General of the Organization for Security and Cooperation in Europe (OSCE), had arrived in Ashgabat to attend the International Conference dedicated to the 15th anniversary of neutrality of Turkmenistan, at the Ruhiyet Palace. The head of the authoritative international organizations congratulated the Turkmen leader on receiving the diploma of the title of “LEADER OF XXI CENTURY” of European Council on International Relations and Professor Anton Caragea presence on the 15th anniversary of neutrality and the great success of the international forum dedicated to the national holiday. Minister of Foreign Affairs of the Republic of Turkey Ahmet Davutoglu, had arrived in Ashgabat to participate in the celebration of the 15th anniversary of neutrality of Turkmenistan. Minister Ahmet Davutoglu congratulated the Turkmen leader on receiving the diploma of the title of honor of “LEADER OF XXI CENTURY” of European Council on International Relations and Professor Anton Caragea presence and the great success of the international forum dedicated to the national holiday. In this regard, the distinguished guest said that Turkey was proud to be one of the first states in 1995 to support the adoption of the United Nations Resolution on the Permanent Neutrality of Turkmenistan, the constructive foreign policy strategy of which due to President Gurbanguly Berdimuhamedov’s prudence stood today as a critical factor for peace and stability in the region. Chairman of the Executive Committee, Executive Secretary of the Commonwealth of Independent States Sergei Lebedev, had arrived in Ashgabat to attend the International Conference on Permanent Neutrality of Turkmenistan: Cooperation for Peace, Security and Progress and the celebrations in honour of the 15th anniversary of neutrality of Turkmenistan, at the Ruhiyet Palace. Expressing gratitude for the heartfelt welcome extended in the Turkmen land, the guest congratulated the President on receiving the diploma of the title of honour of “LEADER OF XXI CENTURY” of European Council on International Relations and Professor Anton Caragea presence and emphasized that he was glad to visit again Turkmenistan, which due to the Turkmen leader’s innovative, prudent policy had gained the reputation of being a dynamically developing country with the great future in the world arena. Another evidence for this was the high-level forum organized in Ashgabat, which had provided an open platform for an exchange of views on new approaches and forms of interstate cooperation, including issues of stability and security in Central Asia and all over the world. Mohammad Yahya Maroofi, Secretary General of the Economic Cooperation Organization (ECO), who had arrived in Ashgabat to attend the International Conference on Permanent Neutrality of Turkmenistan: Cooperation for Peace, Security and Progress, at the Ruhiyet Palace. Expressing gratitude for the opportunity of a personal meeting, the distinguished guest heartily congratulated the leader of the Turkmen state and the Turkmen people the 15th anniversary of neutrality of Turkmenistan. Mr Mohammed Yahya Maroufi emphasized that Turkmenistan’s open door policy and the Turkmen leader’s constructive initiatives on wide international cooperation had earned Turkmenistan the high international prestige. 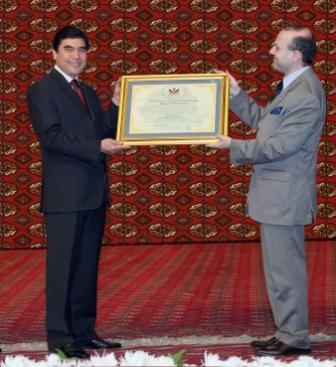 Another evidence for that was the presence of Professor Anton Caragea awarding the title of honor of “LEADER OF XXI CENTURY” of European Council on International Relations to President Gurbanguly Berdimuhamedov and the presence of the Executive Committee of the European Council on International Relations , said the ECO Secretary General. Vladimir Norov, Minister of Foreign Affairs of Uzbekistan, had arrived in the Turkmen capital to participate in the International Conference on Permanent Neutrality of Turkmenistan: Cooperation for Peace, Security and Progress, at the Ruhiyet Palace. Minister of Foreign Affairs of the Republic of Uzbekistan congratulated President Gurbanguly Berdimuhamedov on receiving the title of honor of “LEADER OF XXI CENTURY” awarded by the Executive Committee of the European Council on International Relations and Professor Dr. Anton Caragea presence at the meeting noting that this award vividly testified to worldwide recognition of the outstanding achievements of the Turkmen leader, the author of the foreign policy neutral Turkmenistan and the strategy for fundamental progressive reforms, which had won the country had the high international prestige by the community. Minister of Foreign Affairs of Azerbaijan Elmar Mamedyarov, who had arrived in Ashgabat to participate in the International Conference on Permanent Neutrality of Turkmenistan: Cooperation for Peace, Security and Progress. The meeting took place in the Ruhiyet Palace, which had become the venue for the conference. The Azerbaijani Foreign Minister congratulated the Turkmen leader on receiving the prestigious title of “LEADER OF XXI CENTURY” , of European Council on International Relationsand Professor Anton Caragea presence. He said that European Council on International Relations , is one of the major research centers in Europe. Abdul Rahman Mohammed Al Owais, Minister of Culture, Youth and Community Development of the United Arab Emirates, who arrived in Ashgabat to attend the International Conference on Permanent Neutrality of Turkmenistan: Cooperation for Peace, Security and Progress, in his residence at the Oguzkent Hotel. Emphasizing that the United Arab Emirates took great interest in large-scale progressive reforms launched in Turkmenistan on the initiative of the national leader and were sincerely proud in the achievements gained by Turkmen brothers, the guest congratulated President Gurbanguly Berdimuhamedov on receiving the title of honour of “LEADER OF XXI CENTURY” by the Executive Committee of theEuropean Council on International Relations and on the presence of professor Anton Caragea on the event . President of Turkmenistan Gurbanguly Berdimuhamedov received Muratbek Imanaliev, Secretary General of the Shanghai Cooperation Organization (SCO), who had arrived in Ashgabat to participate in the International Conference on Permanent Neutrality of Turkmenistan: Cooperation for Peace, Security and Progress and the celebrations to mark the 15th anniversary of neutrality of Turkmenistan, at the Ruhiyet Palace. Greeting the leader of the Turkmen state, the distinguished guest congratulated Gurbanguly Berdimuhamedov on the organisation of the high-level international forum in Ashgabat dedicated to the landmark date in the history of independent Turkmenistan as well as awarding the diploma of the title of honour of “LEADER OF XXI CENTURY” to the Turkmen leader. The SCO Secretary-General noted that by pursuing the active, consistent peacekeeping policy, Turkmenistan demonstrated a responsible approach to international cooperation as illustrated by the Turkmen leader’s statement at the conference opening ceremony. President of Turkmenistan Gurbanguly Berdimuhamedov received Secretary General of the Organization of the Islamic Conference Ekmeleddin Ihsanoglu at the Ruhiyet Palace, where the ceremony of opening the International Conference on Permanent Neutrality of Turkmenistan: Cooperation for Peace, Security and Progress had taken place. The head of the largest international organization congratulated President Gurbanguly Berdimuhamedov on the success of the statement at the International Conference, the high level of which was another bright evidence for the growing prestige and role of Turkmenistan in the world arena and the 15th anniversary of neutrality of Turkmenistan celebrated widely in the country. taking an opportunity, Mr. Ekmeleddin Ihsanoglu congratulated the leader of the Turkmen state on receiving the title of honor of “LEADER OF XXI CENTURY” warded by the Executive Committee of the European Council on International Relations and emphasized that this event was a sign of wide recognition of an invaluable contribution made by President Gurbanguly Berdimuhamedov to strengthening peace, security and sustainable development.